LadyBroadoak Visionary Planetary Healing Tutorial: On the TNIK-BP arrests ..
On the TNIK-BP arrests ..
On the surface it is a straightforward case of industrial espionage. Russian security agents arrest two Russian-American brothers, one of whom works for a large Anglo-Russian oil company, and charge them with stealing industrial secrets. The statement from the federal security service (FSB) says the men were caught in an "attempt to receive confidential information and commercial secrets from a Russian citizen". It says the information was intended "for the use of foreign oil and gas companies with the goal of obtaining a concrete advantage over Russian competitors". And that may be exactly what happened. But the immediate reaction of people in the oil industry here in Moscow has not been: "Did they do it?" but instead: "What is the Russian government up to this time?" Many suspect that the charges against Ilya Zaslavsky and his brother are politically motivated. First there is the nature of secrets in Russia. As one oil industry analyst put it to me: "In Russia all geological information regarding oil and minerals is still classified as a state secret. Sending any such information out of Russia, even for the purposes of a financial audit, could be considered illegal." In other words it would not be difficult for the Russian security services to come up with evidence of wrongdoing if they really wanted to. Perhaps because someone in the Russian government wants to put pressure on someone in the Anglo-Russian oil giant TNK-BP. It is no secret that the Kremlin wants to regain control over all of Russia's strategic energy assets. Over the last few years it has methodically, and sometimes brutally, moved to retake control of many of the oil and gas fields sold off by President Boris Yeltsin in the 1990s. The most infamous example was the prosecution, bankruptcy and dismemberment of Russia's biggest private oil company, Yukos. Its former boss, Mikhail Khodorkovsky, is still languishing in a Siberian labour camp. Later the Russian authorities went after Royal Dutch Shell, accusing it of breaking environmental laws on its huge Sakhalin II gas field. Eventually Shell sold a controlling stake to the Russian state, and the environmental problems disappeared. Now many believe the Kremlin wants to get its hands on the assets of TNK-BP. 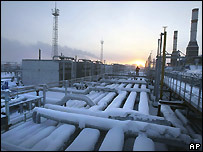 In particular they want BP to sell the huge Kovytka gas field in Eastern Siberia to state run Gazprom. BP has agreed to sell, but the two sides can not agree on a price. Others think the Kremlin wants to get its hands on the whole company. Rightly or wrongly, very few in the oil industry here believe the case of the Zaslavsky brothers is a straight-forward one of industrial espionage. Kremlin hand behind spy charges? The article from the Times link ..